"You know what the chain of command is? It's the chain I go get and beat you with until you understand who's in ruttin' command here!" He's one tough son-of-a-gun, this Jayne Cobb. When it comes to brute strength and marksmanship, no one's better in an adrenaline-pumping battle, which makes him mighty useful as a crewmember aboard Malcolm Reynolds' ship, Serenity. He even shows faint signs of a conscience every now and again. But Mal knows better than to turn his back on this opportunistic, if likeable, soldier of fortune. If "a better deal" comes Jayne Cobb's way, there's always the chance he might take it. 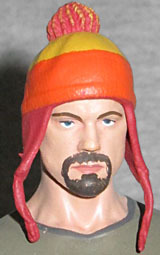 There was a normal Jayne in the regular series, but, like Tyrion Lannister, there was an exclusive that was better. Available only through Previews, the variant Jayne comes with his cunning hat - the one his mother made for him, to keep him warm in space. It's not nearly as iconic as Firefly fans would have you believe (though there are ways to make it more memorable). The face is a little puffier than it should be, but it's still recognizably Jayne. The hat only ever appeared in one episode, and he wasn't wearing this shirt with it. That shirt was brown, with a large orange square design on the chest; this one is grey-green, with 勇 (brave) over the left breast. 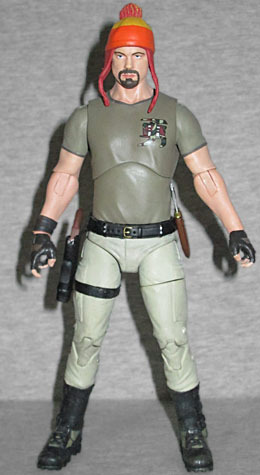 Like the rest of the figures in Series 1, the figure is based more on the promotional stills than on any specific episode, though you can see this shirt several times throughout the show's run. He's wearing his typical cargo pants, plus brown fingerless gloves, a leather cuff on his right wrist, and stylish combat boots. And naturally, he's got a black belt with a sheath, a holster, and a pouch on the back. Although there aren't many details in the sculpt, what we do get is surprisingly crisp. 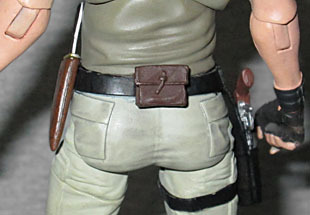 Remember how soft Mal's sculpt was, particularly where his shirt disappeared into his pants? Jayne is much better than that! Even the three buckles on his boots, which you can't really see very well unless you get right in there and look for them, are sculpted excellently. The quality on this series is really all over the place, isn't it? His articulation is what you've come to expect from Funko's Legacy Collection figures: balljointed head, torso and hips; swivel/hinge shoulders, elbows, wrists and ankles; swivel thighs; and double-hinged knees. A lot of the joints are made from the clear plastic - you can see it blatantly in the knee-pins, for instance - but nothing broke. I did have to boil his wrists to get them moving all the way (the right wrist wouldn't swivel, and the left wrist wouldn't hinge), but even that was simple. It would be better if his head had a fuller range of motion; as it is, it really only turns side-to-side, not moving up and down at all. Being the team gun nut, Jayne comes with three weapons: a knife to sheathe in his belt, his custom sidearm (a modified single-action LeMat Revolver), and the Callahan full-bore auto-lock with a customized trigger, double cartridge and thorough gauge that he calls "Vera." Vera was built from an Izhmash Saiga-12 shotgun, but not for Firefly - it was created for a 2002 Robert De Niro/​Eddie Murphy movie not a single person on Earth actually remembers, an action comedy called Showtime. In that movie, it fired depleted uranium shells and had a hinge in the middle of the silver section so it could be used in a compact configuration. Presumably Vera does too? 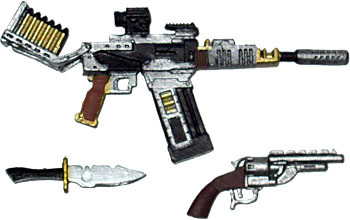 Oh, and according to Baldwin, the knife is named "Binky" and the pistol is named "Boo." There was a Jayne figure in the same craptastic Serenity line that brought us "Bill O'Reilly Captain Mal," but it was, no surprise, terrible. 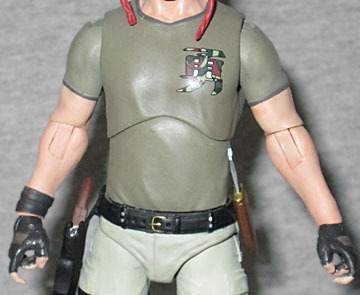 It barely moved and the face looked more like Joel Hodgson than Adam Baldwin. 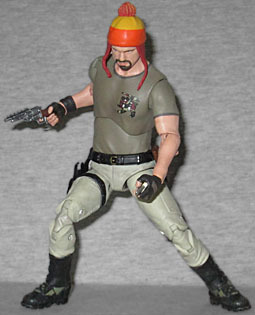 And though Baldwin himself is always about a week away from re-creating Jayne's hat out of tinfoil, the character deserves a better toy than that. Fortunately for all of us, Funko delivered it.